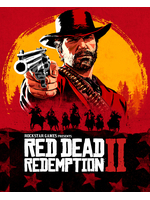 As teased by Rockstar Games a few days ago, here is the second official trailer of Red Dead Redemption 2 that depicts Arthur Morgan and the Van der Linde gang. Stay tuned as we'll update the news with a higher quality/bitrate video once we get our hands on it. Tha game will be out in Spring 2018. Looks awesome, still spring 2018. Is there an English higher quality version coming or was that the french version? wow, the protagonist is Generic McGenericFace. doesn't excite me in the slightest, but it looks pretty nice. How did you get the trailer right after it was on youtube ? and how do you guys get all other trailers from publishers ? Still no word of a PC version? As it stands now I'll play it on PS4 then, but I would prefer to play the online part (if there is any) on PC.. Maybe they'll add it later like they did with GTA-V.. This looks pretty darn impressive to look this good on the regular PS4. I'm excited to see how it would look on the PS4 Pro and Xbox One X. Since when has any R* Protagonist ever looked anything other than a generic sort in terms of looks. They all look appropriate according to their character, which is what Rockstar's strength is when they create them. I don't know. Perhaps he should have had a big scar down one side of his face, had a handlebar mustache, and wears an eyepatch. Oh, wait...that's snake from MGS. Anyway, this game seriously looks amazing, but I'm not surprised by that at all. Horizon might have been getting all the attention as far as how its open world looks lately, but from the technical stuff I'm seeing from this trailer, this surpasses it and then some. I never really understood why Rockstar never really fully get the credit they deserve for how well they build their engines and how they get their games to look, given the amount of detail they pack into their environments. GTAV is still a marvel to me when it comes to that stuff, and is still the benchmark, whereas most other open world games are cut and paste generic asset drops. Yeah, I'm looking at you Ubisoft and EA. Yea, the trailer paints the protagonist as a roughneck outlaw, and he looks the part in a very naturalistic way. He is not some jacked up caricature. No doubt there will be more to this guy than what one can deduce from the trailer. Probably pretty much the same. In comparison to some other open world titles such as Horizon Zero Dawn (ps4), The Division (PC) or Ghost Recon Wildlands (PC) this looks already outdated. so good that its world building and art production is miles ahead. It kinda does. Look at the textures, they're pretty shocking. No tessellation on ground work either so everything looks flat. A general soft/fuzzy IQ (typical of GTAV tbh) it just seems to lack clarity and detail one would expect from a current gen only R* title. As with RDR it seems to be a game you can appreciate at distance with its large vistas, but close up it looks decidedly average. As for the protagonist, marston at least had distinguishing features that set him apart. This guy looks like a random enemy model, devoid of any sort of visual personality...and on top of that, he seems to be a grade A arse hole that gives alan wake a run for his money, which it a hell of a feat. My hope at this point is that there are multiple protagonists and i can just ignore this douche entirely. The original (which I know you weren't a fan of anyway) always had that soft, almost painterly look to it that captured the landscapes and vistas of the setting of the wild west to a tee. That game is still technically impressive to look at. It's not all about ultra sharp, detailed textures. It's about the macro level when it comes to open world. As far as your other complained of no tessellation, that's an odd one, because tessellation is one of the first things I spotted in the trailer, and you can clearly see it on the mud effect that's collecting on the wagon wheels about 25 seconds in, with some nice displacement mapping on the ground. Add to this the amazing looking volumetric effects like the physics based smoke coming from the train, which is also being dynamically lit by particles, and the level of detail of the foliage that stretches into a crazy draw distance, it baffles me how anyone can look at it and think it looks dated. As I've said, it's strange to me why Rockstar are never in the conversation when it comes to technical stuff. They've come a very long way since their DMA days. I liked the first one (or was it the second one? ), but as with all open world games, I got tired of the grinding. I just don't get why devs think that is needed in every open world game. I wouldn't mind it if it yielded rewarding results other than just selling to get more money. 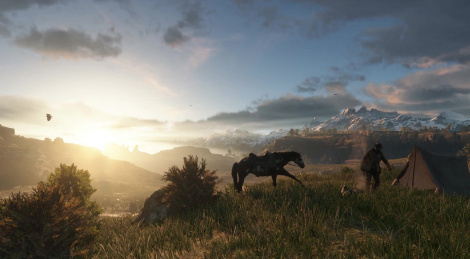 It's sort of the staple thing now in most open world games that has wildlife in it, maybe apart from GTAV, which animals were just in there as a detail, or a threat. Maybe if they made it more challenging to hunt and kill certain things, that would alleviate some of the tedium and make it more rewarding to do so. Then again, when you've a rifle and pistols...maybe its all just a case of balancing that stuff out. Something like Breath of the Wild, where you've to wait for certain times of the day or night, or weather conditions and locations to snag a certain prey. The textures definitely seem downgraded from the previous teaser and screenshots; they seem really lower res in this video. The fact it isn't on PC makes it outdated.